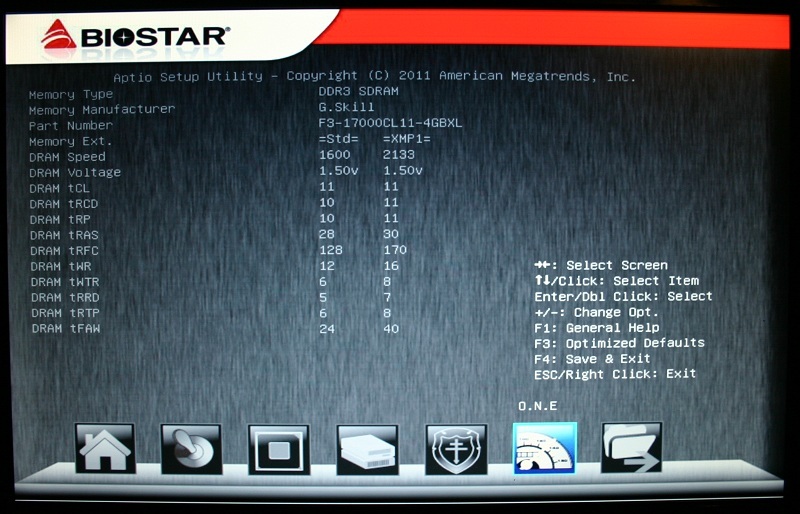 Today we will be looking at one of Biostar’s socket FM1 motherboards that is targeted at the mainstream computer market with an affordable price tag. 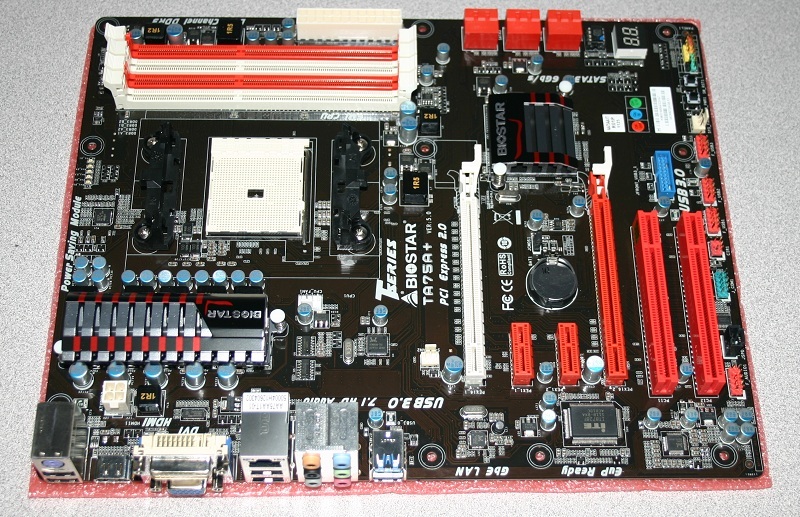 This motherboard is for the Fusion A series and E2 series processors featuring the new AMD A75 (Hudson D3) chipset. This specific board is the top of Biostar’s current socket FM1 offerings. 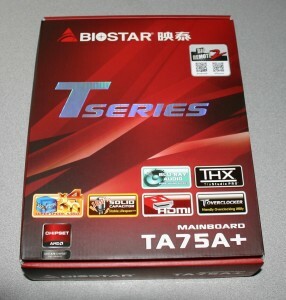 The box for the Biostar TA75A+ is simple and functional. The base of it being a flat tone, highlighted with Tseries in silver. The features listed on the front are shiny and embossed into the cardboard which makes them really stand. 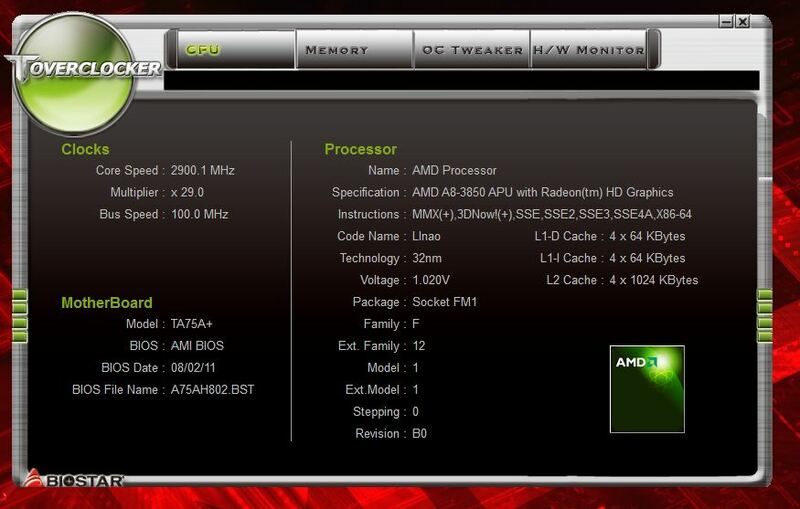 In the lower left hand corner is the AMD chipset badge with “AMD A75 Chipset, FM1 socket” listed below. 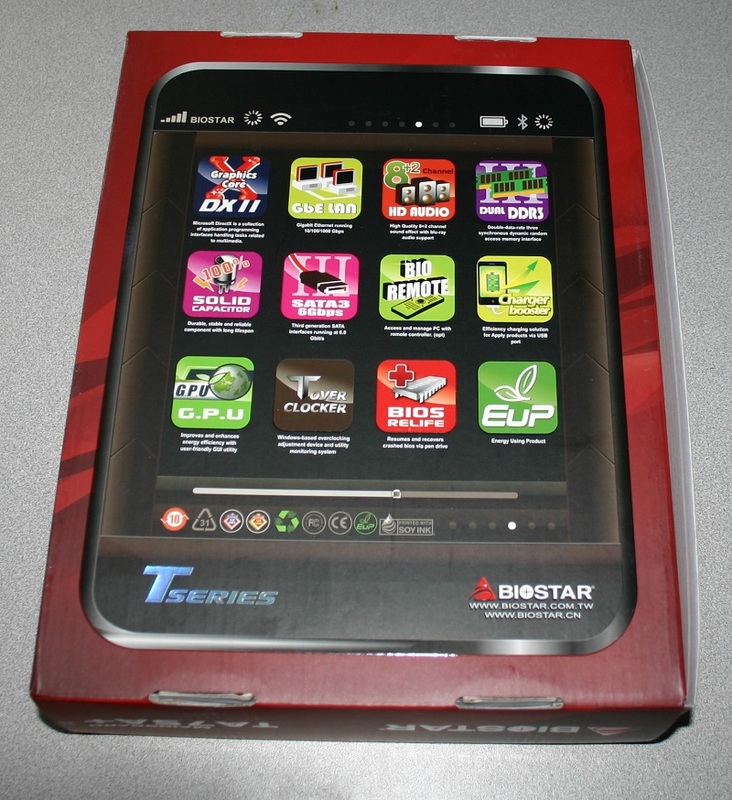 On the back of the box a continuation of the display of features in a layout that resembles a touchscreen smartphone. 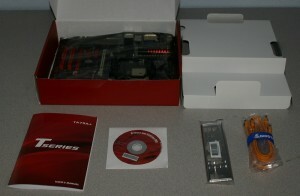 Inside the box are the usual accessories, including the manual with the driver and utilities CD tucked between the pages. A rear I/O shield in a plastic bag, and four orange colored locking SATA cables that are straight on both ends. Which personally I welcome because I am not a huge fan of the ones with a 90-degree angle at the drive end. All of this is sitting on a cardboard tray which covers the motherboard to prevent damage while shipping. The box also included a Biostar branded Velcro cable strap (not pictured). Once you remove the motherboard from a partially clear anti-static bag. You are greeted with your first unencumbered view of the motherboard. 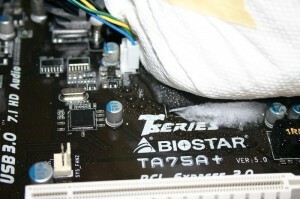 You also realize that once again Biostar has taken the precaution of putting a non-conductive foam pad under the board. This not only works wonders at protecting the board during shipping but saves some wear and tear on your fingers while handling the board prior to installation. Biostar TA75A plus, out of its wrapper. AMD’s Lynx platform has a fairly robust set of standard features. As far as base features go, they are equal to or greater in some cases than the current Intel offerings for desktops. 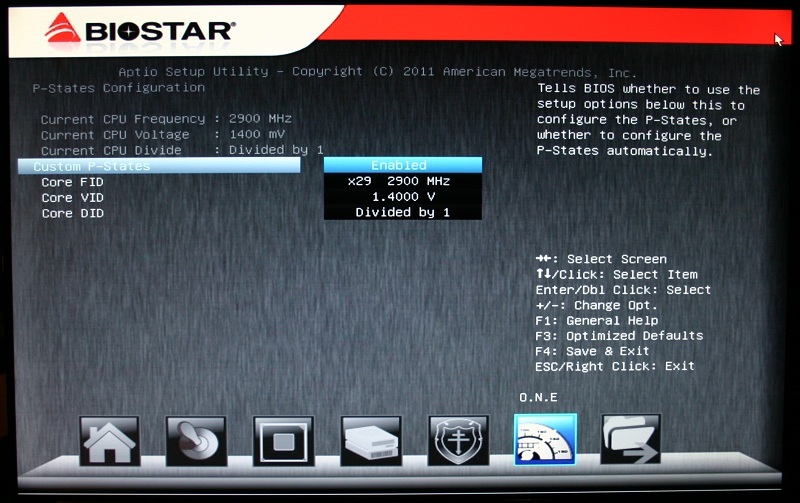 Something manufacturers like Biostar use as a starting point for their motherboard designs. 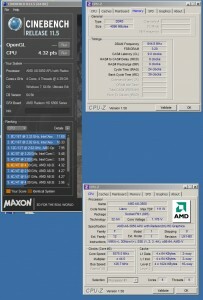 As one might expect, the essentials are covered mostly by AMD’s A75 (Hudson D3) chipset. Biostar has their own set of additional features that enhance the experience. 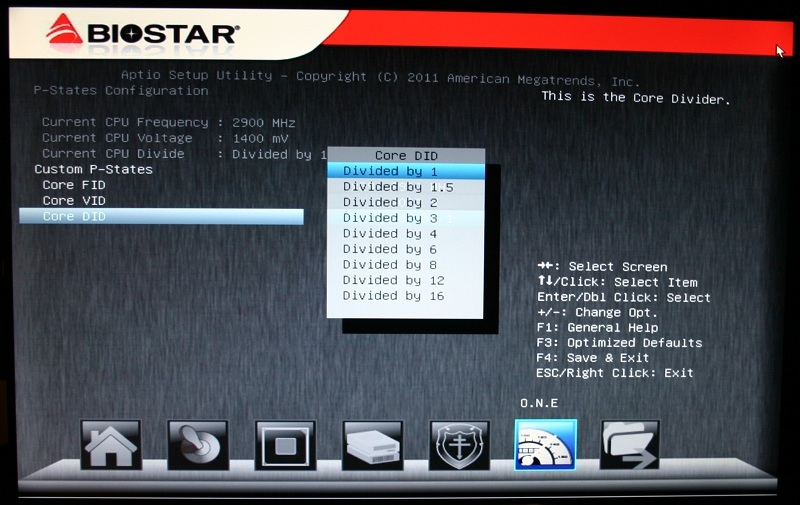 Rapid Debug 3 – This is a double digit LED display that is built into the motherboard. It both provides error and status codes for debugging. However once the system has enter a normal state of running. The display serves a double purpose as a core temperature thermometer. 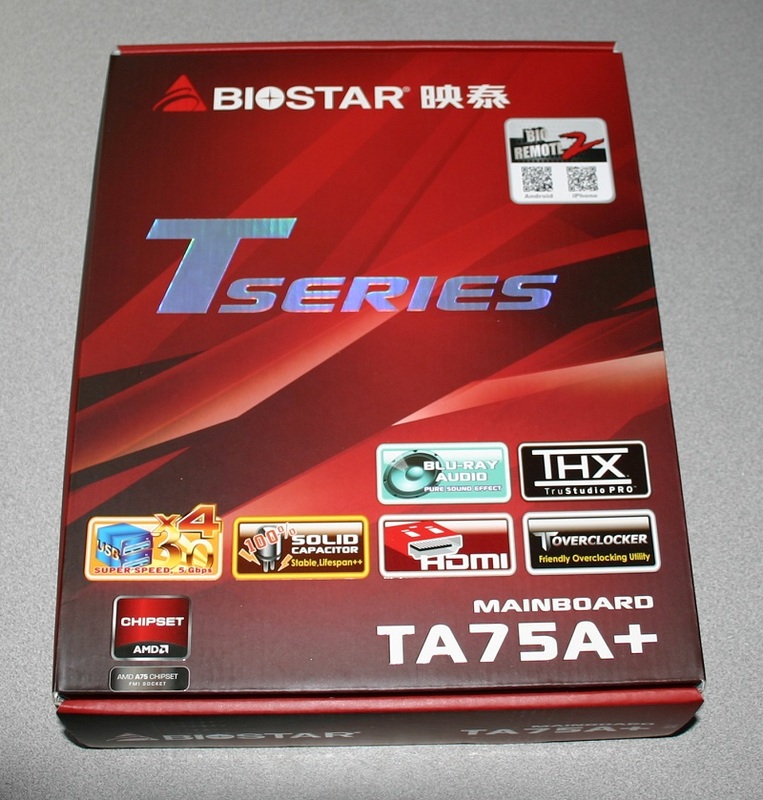 Bios RELIFE – This is feature that more and more companies have been adding to their motherboards lately. Biostar however has a very interesting method of implementing it. 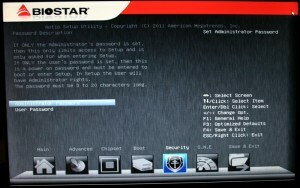 It allows you to restore a bios Image to a damaged bios. Simply plug in a USB flash drive into the board. Then set the clear cmos jumper to the clear setting. Then power on the system. 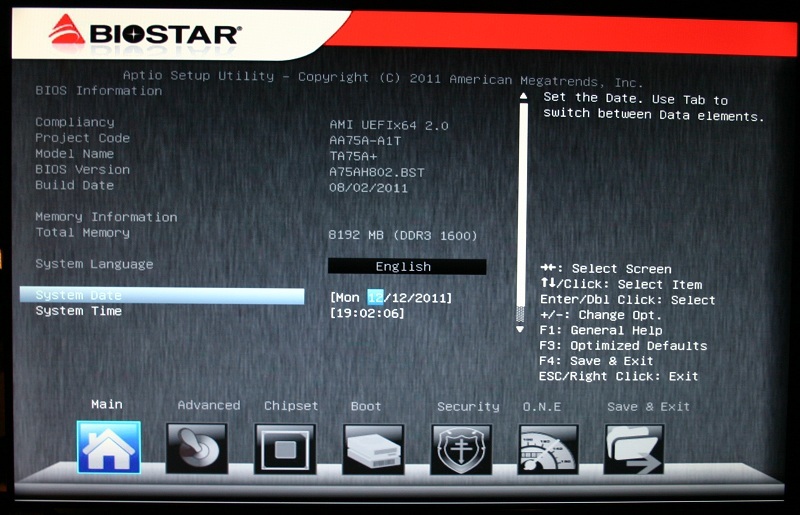 You can then watch the status of the bios reflash process on the debug display. The Manual Include instructions as well as the readout settings to expect during the process. 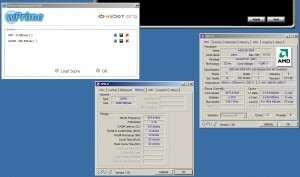 BIOS Flasher – This is another feature that has been seen across more and more motherboards by varying companies. I consider it to be a welcome feature on any board, this one included. 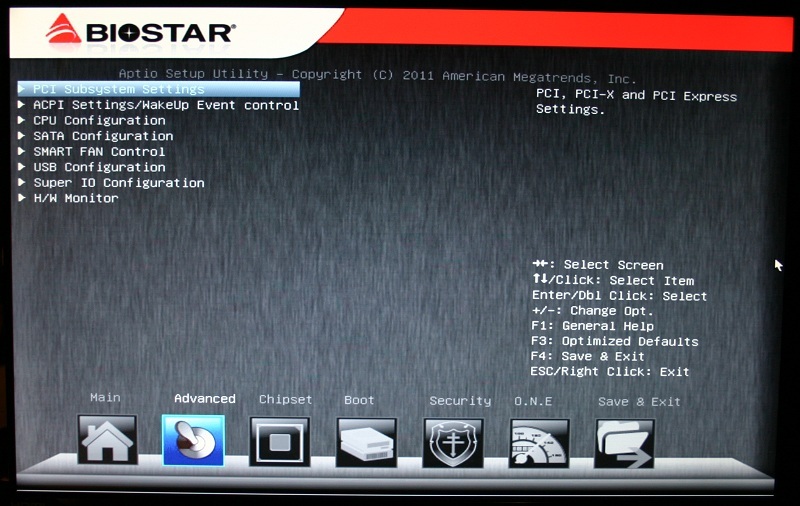 A simple Key Combination of (insert later) will bring up a on screen bios flashing utility. 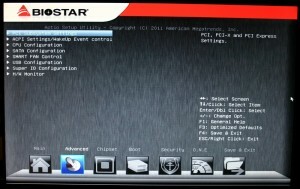 It makes easy work of updating the bios. Rapid Switch – A very simple but welcomed feature. That Most enthusiasts, overclockers, and benchers will welcome. It consists of a built in power, and reset switch built into the board. For anyone that tests their equiptment outside of a case. Or maybe you’ve spun your case around and don’t have easy access to the power and reset switch while working on your machine. The buttons are fairly easy to access, and are in close proximity to the debug display. 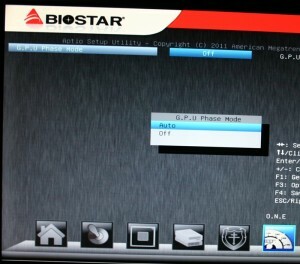 Bio Remote 2 – This is a second generation version of Biostars Bio Remote feature set. 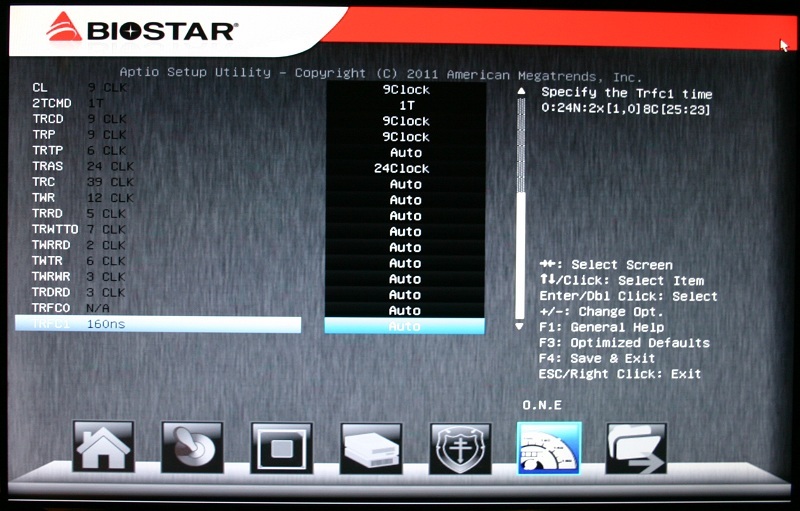 Unlike the first generation version of this software (Bio Remote), it does not require the purchase of a remote and IR port. It provides Windows Media Center functionally through your local wifi network via iphone/ipod or android devices. Obviously this requires your computer to be connected to a network that has wifi access. It also requires the installation of some software on both your computer and your selected mobile device. 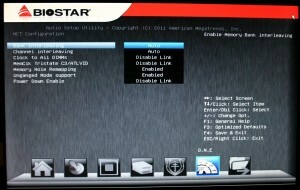 This is a feature that is sure to be welcomed by the HTPC market. It requires a version of windows with Microsoft media center software suit. Most copies of Windows Vista, and Windows 7 support this out of the box with no extra configuration. 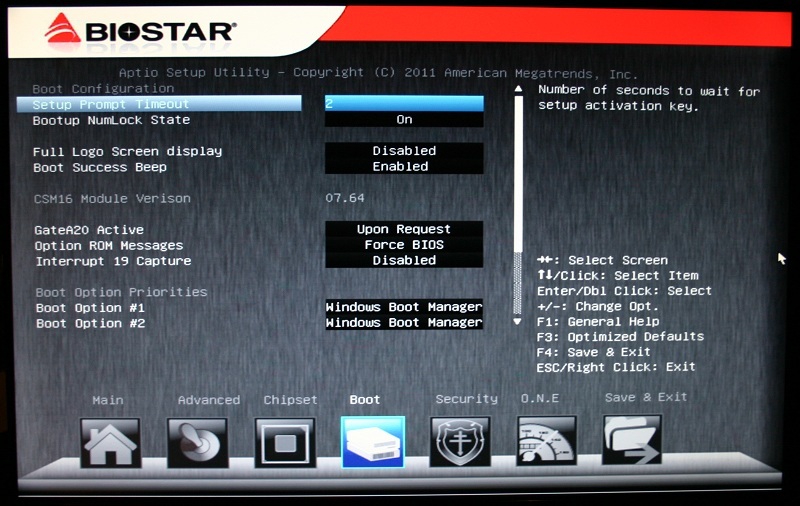 UEFI Bios – Biostar has extended its bios to both include a graphical user interface, aswell as extended support for UEFI enabled devices. 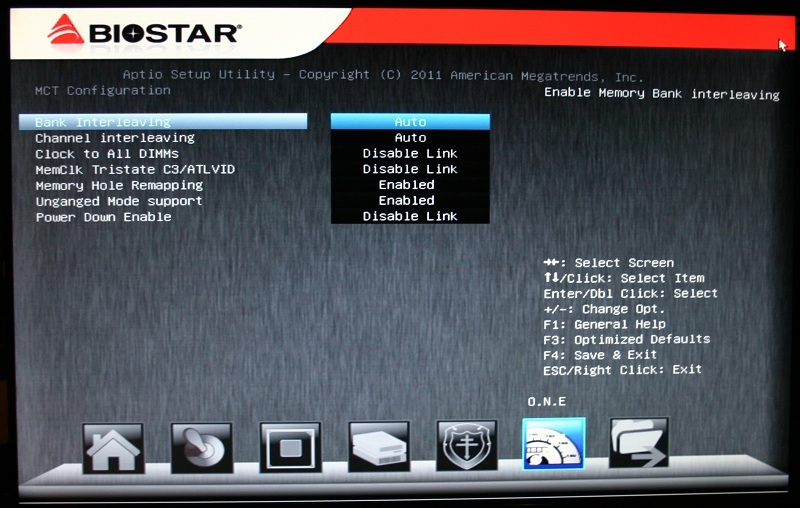 This is among the first of Biostar’s product line to include this feature. It is still somewhat infant, but fully functional. 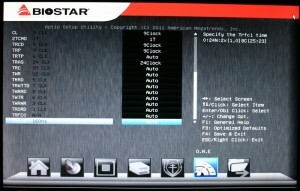 Biostar suggests that you download documentation from there site related to the revision of bios your running. This is due to the expected changes that the bios will under go as it continues to mature. I personally would also recommend this, because the level of documentation is superior to that provided in the box. I am not saying it’s a problem, but it certainly goes into more detail. G.P.U. Green Power Utility – The Green Power Utility is a little more complex of a system that it appears to be at first glance. Not only is it augmented by some additional software to help with its efficiency. But it actually adds to the amount of active power phases in use, on the fly. 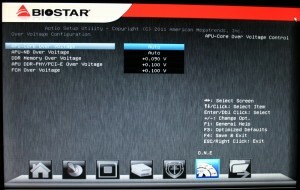 To help illustrate this to their users Biostar added a set of lights next to the CPU. Which displays how many phases are in use. The LED’s show phases one through four for the cpu, aswell is power status of the north bridge. Currently you don’t have access to control the VRM’s much beyond having the feature enabled or disabled. 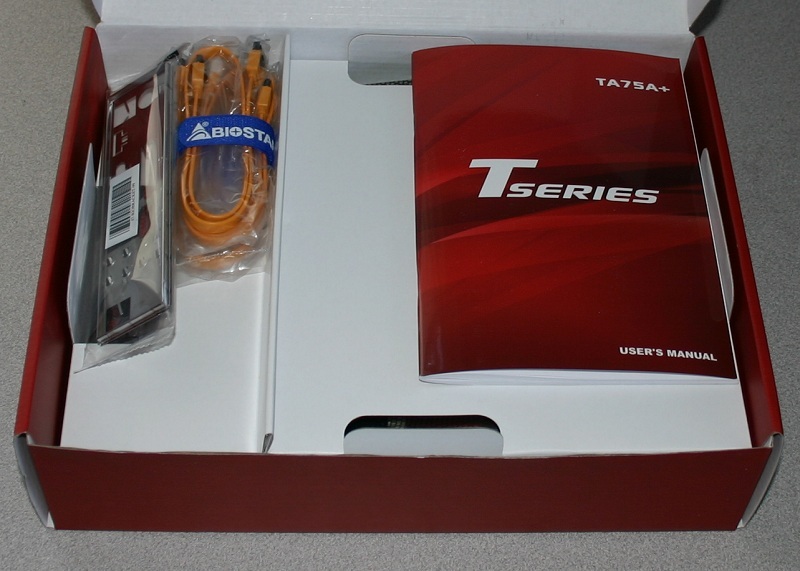 Now let us take a look at the design of the TA75A+. 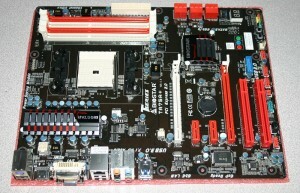 The board itself fits into a standard ATX form factor at 12.1” W x 9.7” L (30.5cm W x 24.4cm L). Since the target market for this board is aimed at those looking for more expansion options. The board also features six card slots. 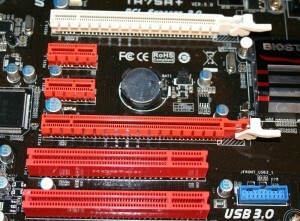 Two PCI slots, two PCIe 2.0 1x slots, and two PCIe 2.0 16x slots. The first PCIe 16x slot is a full 16 lane slot, the second is only four lanes wide. This puts the board on par with most mainstream boards of the same size, outside of the enthusiast level boards. As you may notice, the board features only six total slots, one less than most boards of this size. 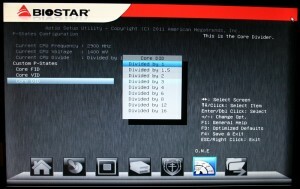 Biostar has decided not to add an additional 1x slot above the 16x slot. This leaves a little more room for circuit design. One thing that does become apparent about the PCIe card slots is the retention mechanism for 16x cards. The release finger is in a location that can make it extremely difficult to release when using double width cards. This is unfortunate since most mid to higher end graphics cards these days make use of one or two additional slots for cooling. The back of the board is as clean as can be expected. The finish quality on the back of the board is top notch as well. Very clean no left over flux or other residues from the manufacturing process. Which some high end boards have seemed to be plagued with lately. 6x Audio connectors – Line in, Line Out, Microphone, Center, Side and Rear. 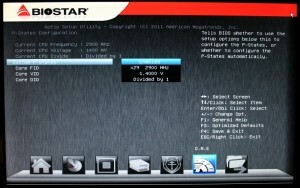 Biostar TA75A plus, external I/O ports. The VRM’s and south bridge, as expected, are covered by heatsinks. Both are passively cooled so no worries about added fan noise here. 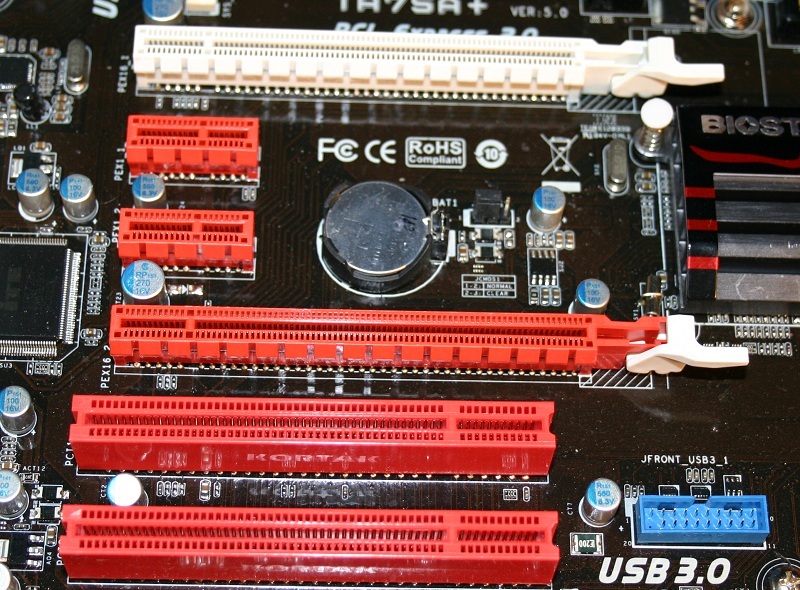 Both heatsinks are held to the board with spring tensioned plastic pins. The side view of the VRM heatsink is particularly interesting. This a decent sized heatsink for what its covering up. Looking at the VRM with the heatsink removed, there are fifteen large mosfets with two smaller ones nestled between them on the left side. The heatsink showed good contact, with a reusable contact strip. There are also two smaller black contact strips laid atop of the main one, for the two smaller mosfets. The southbridge shows a similar setup. Once again held down by the spring tensioned plastic pins. 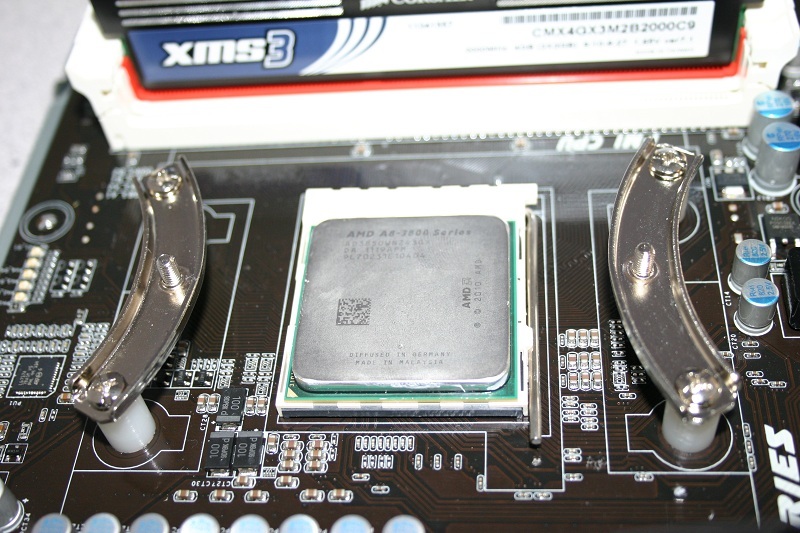 The heatsink itself is quite small, just enough to cover the AMD A75 (Hudson D3) bridge chip. Upon inspection of the southbridge heatsink after removal, there was good adhesion. 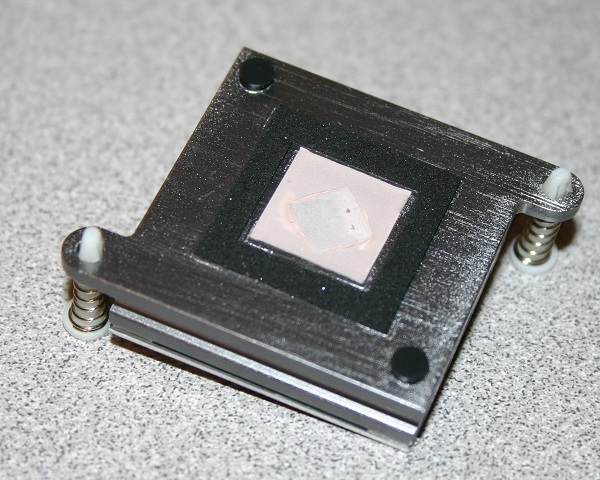 A small pink thermal pad is used by the factory to provide thermal transfer. 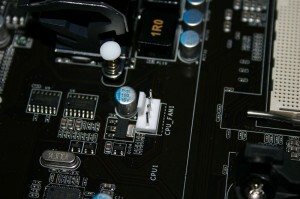 A black pad encompasses that pad, to prevent shorting out against surface mounting components on the bridge chip. 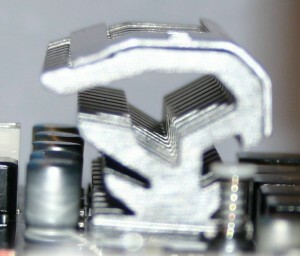 Two small felt feet sit opposite to the pins to stabilize the heatsink. The socket area is fairly clean and uncluttered. Though you quickly notice that the normal location of most fan headers are absent. Being located closer to the PCIE slots. To the left side you will also notice a small selection of LED’s which show the current active power phases. The downside to use a pinned socket is that sometimes the chip will come out attached to the heatsink. Mostly during a really solid interface between the two surfaces. This is a good thing thermal conductivity wise, however it can be a pain if your constantly tinkering with your system and swapping heatsinks or chips. 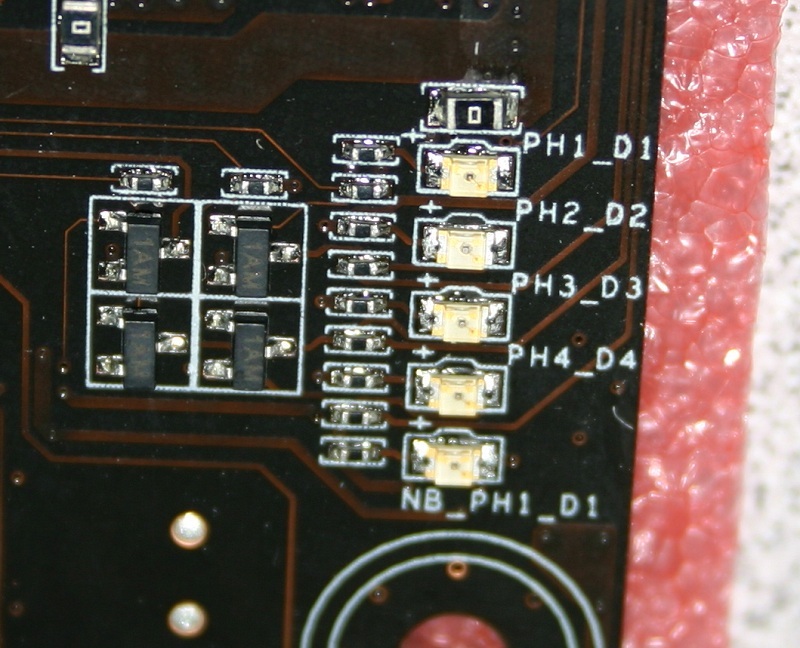 This board seemed to have a rather loose grip on the chip, compared to some of the other FM1 boards on the market. This resulted in the chip coming out of the socket attached to the heatsink every time no matter how careful I was. This also ended up in a few bent pins at times. Wait did I use Thermal Epoxy or thermal paste? The UEFI bios on the TA75A+ can be a little confusing at first, at least for those of us that have been indoctrinated into graphical BIOS offerings. It is not really that it doesn’t function correctly. Just that every company seems to have their own style of laying out a BIOS. 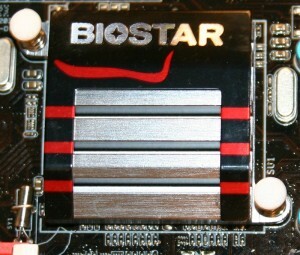 Having not worked with any Biostar boards in a long time, if ever (at least that I can remember), I was at first a little confused. 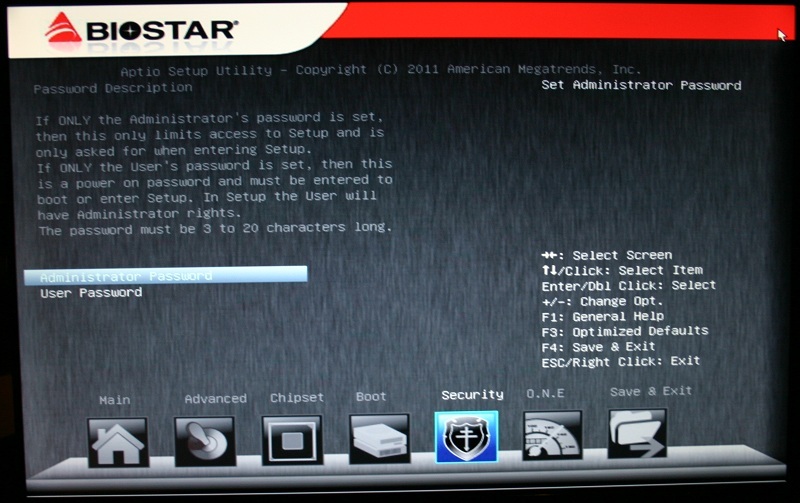 However, after a few minutes of playing around, as well as downloading the most current documentation from Biostar’s website, I was traveling through the BIOS like it was second nature. While you can use a mouse to navigate the menus to some degree. I found it much easier (not to mention quicker) to tab through, with assistance from the arrow keys. 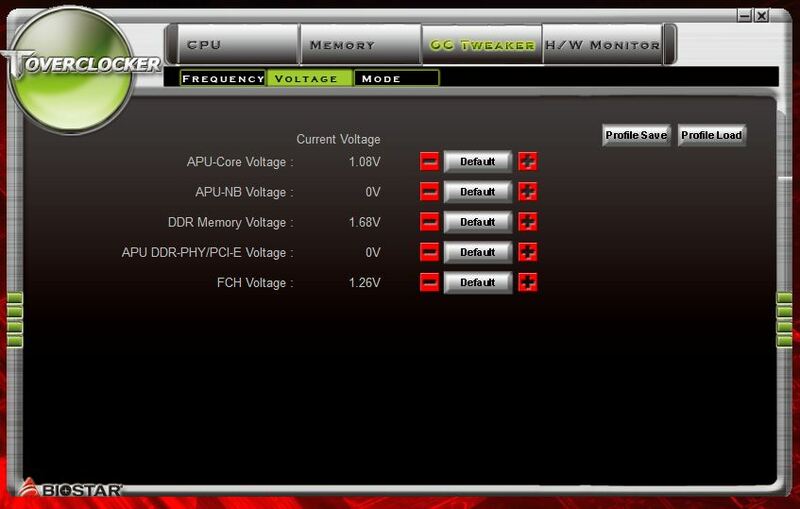 The first screen you will see once entering the BIOS holds basic information about the board. 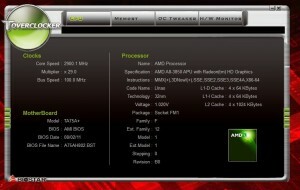 Information about the BIOS, its version, hardware, and build date. Followed by a selection of language and the date/time settings. You will also see a series of navigation buttons at the bottom of the screen. 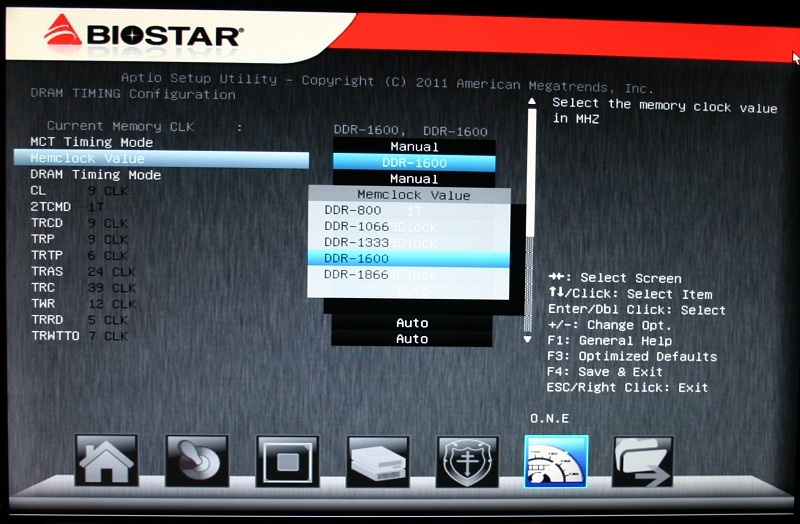 These allow you to navigate to different groups of settings in the BIOS. 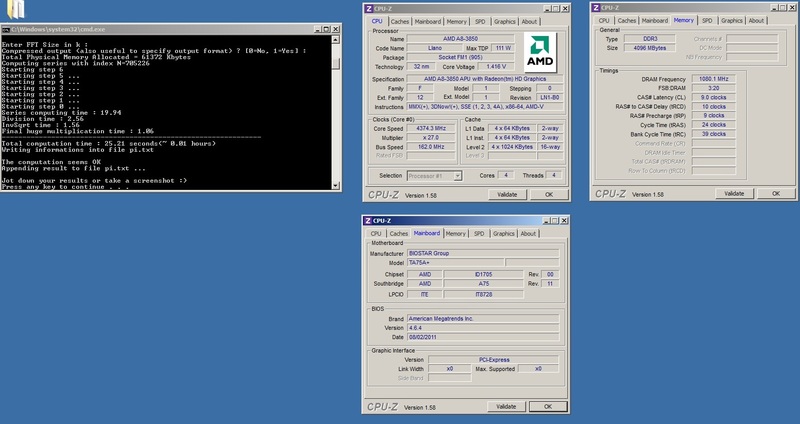 Similar to how you would on a normal BIOS. This first page being suitably named Main, shows that it’s the current selection by highlighting the Main button, at the bottom of the page. 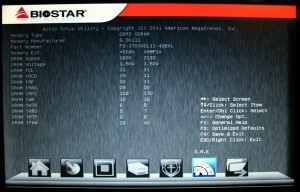 The BIOS pretty much maintains this appearance as you navigate through it. There are an array of options that you would expect from any motherboard. Boot options, onboard device settings and hardware monitoring/APM options. You won’t really see anything out of the ordinary until you reach the O.N.E. 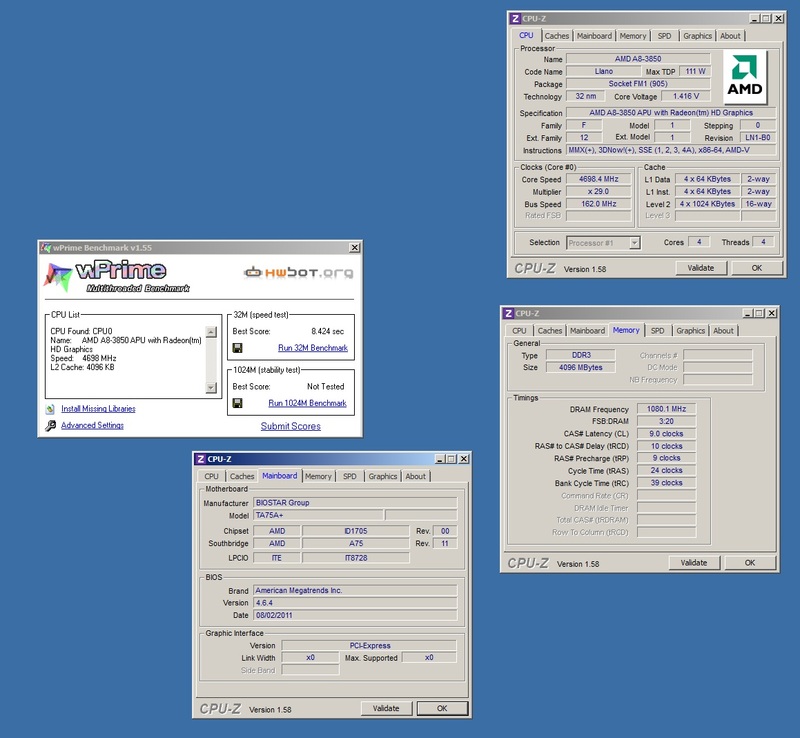 tab of the BIOS. 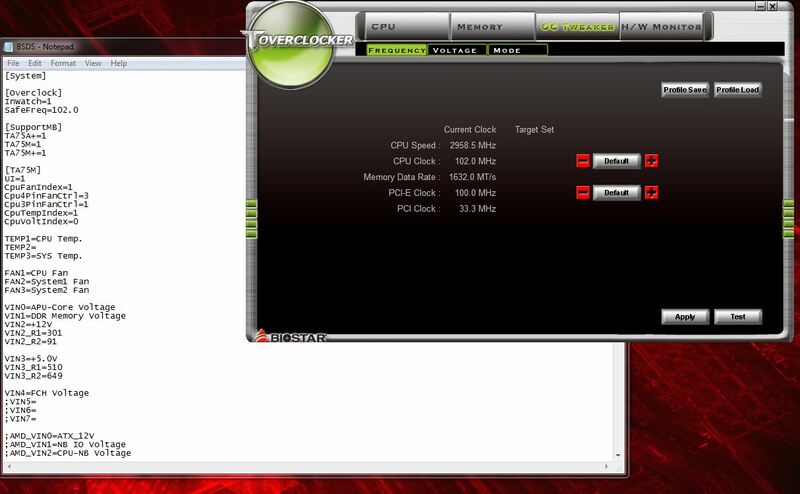 O.N.E which stands for Overclocking Navigation Engine. 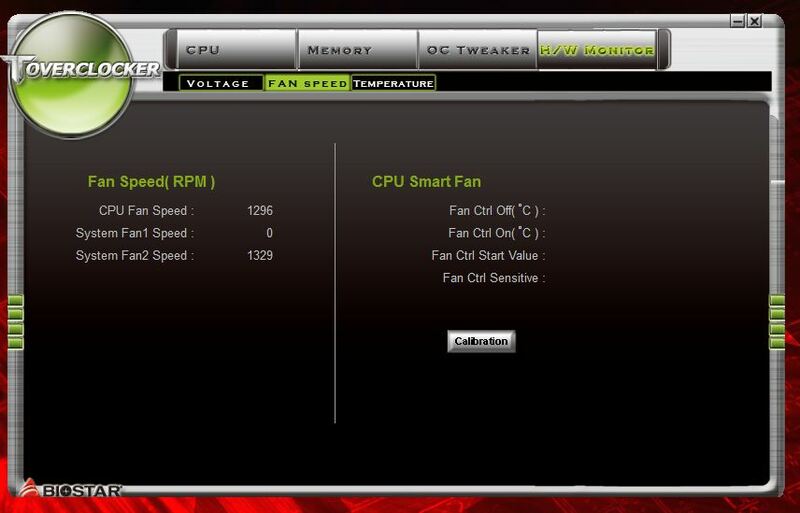 This section not only houses overclocking options for CPU and RAM, but some advanced power management features, such as limited phase control for the power section of the board. I will mention that further when we take an in-depth look at that part of the BIOS. The initial View of the O.N.E section Generally shows the bulk of the options grayed out since the Overclock navigator option if off by default. Once this is changed Either to Manual Overclock or Automated Overclock, you will see the bulk of the options become accessible. The available choices at this point are fairly straight forward. 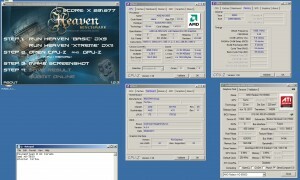 The Auto Overclock section of the BIOS becomes available on selection of Automated Overclock. Which offers three choices of power delivery and aggressiveness, V6, V8, and V12. I can’t say that I found these to be much use, but its a basic starting point for less experienced overclockers. 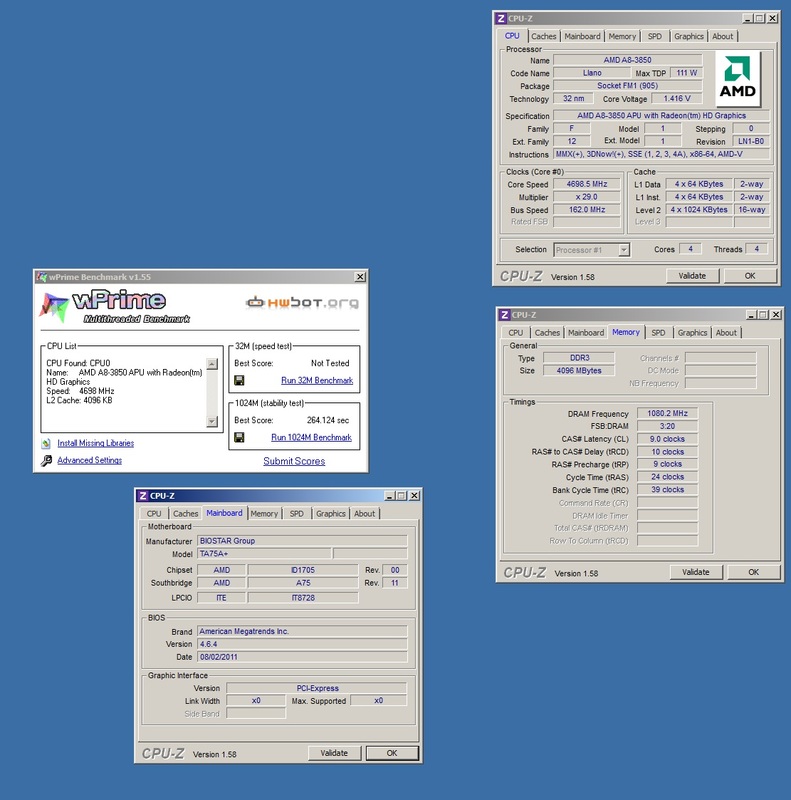 Sections exist for processor multiplier (marked P-States Configuration), Over Voltage Configuration, DRAM Timing Configuration, MCT Configuration (which is additional ram settings mostly), Biostar Memory Insight, and G.P.U Phase control (Biostars Green Power Utility settings). 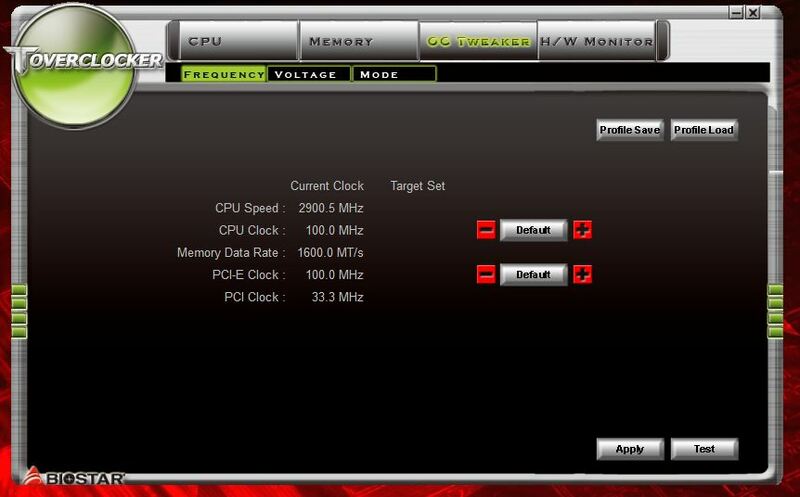 Other settings also available without navigating to a sub-section are Auto Overclock System settings, CPU clock, Spread Spectrum, and settings for the IGD (Integrated Graphics Device) Clock Control. 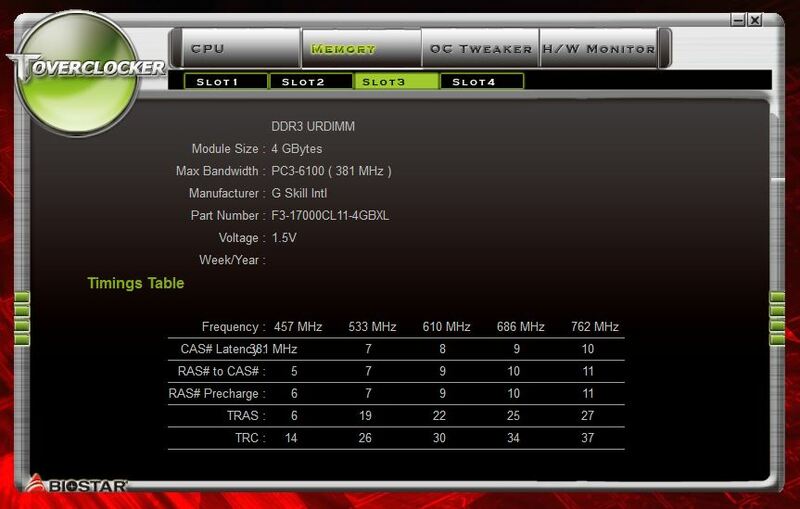 The P-States section provides access to only four settings, though it does supply information about the current CPU settings such as, frequency, voltage, and divider used for the multiplier if you choose to use any. Once you enable Custom P-States the other three options will appear on the screen. Each are quite straight forward. 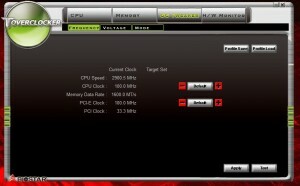 Core FID for CPU multiplier, which gives you choices of multipliers and a listing of what the speed of the chip will become at those settings. 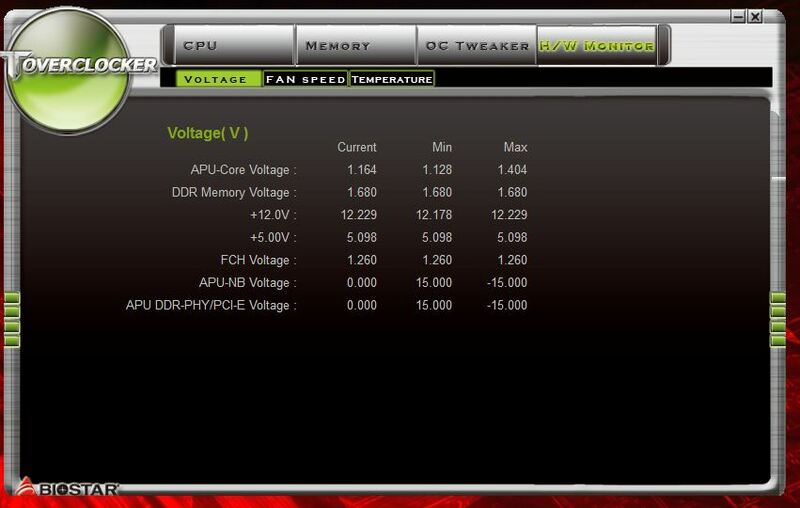 Core VID for core CPU voltage adjustment, this setting is partially mirrored under the over voltage settings, though only as an additional offset modifier. Finally, there is the Core DID settings for changing the effect of the multipliers. So, if you want each FID step to be half steps, you can change this to divided by two. A decent range of settings exist for this to help with fine tuning. This is quite handy as most of the FM1 boards in the market do not offer quite this level of multiplier control. So, it’s a definite bonus to those using locked chips to get the max out of their setups. The OverVoltage Configuration section is once again fairly slimmed down and straight to the point. By default obviously these will be set to auto. They are all offset based voltage changes. So, going up and down by generally 0.010 V at a time. Not my favorite method of overvoltage control but it works and that’s what matters. Onto the DRAM Timings Configuration section. 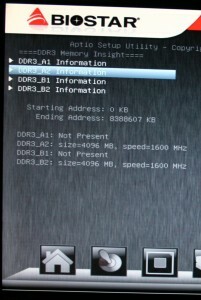 This is really a quite complete section of settings for those interested in ram overclocking which is something you will want to spend time with when overclocking APU’s. This will be straight forward to those used to working with advanced RAM settings. You can choose to let the system detect your settings to a point. However, the few revisions I have used of this BIOS tend to use either the first listed group of settings from your RAM’s SPD chip. 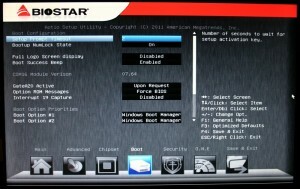 That or it will use a varied group of settings that at times can cause boot problems. 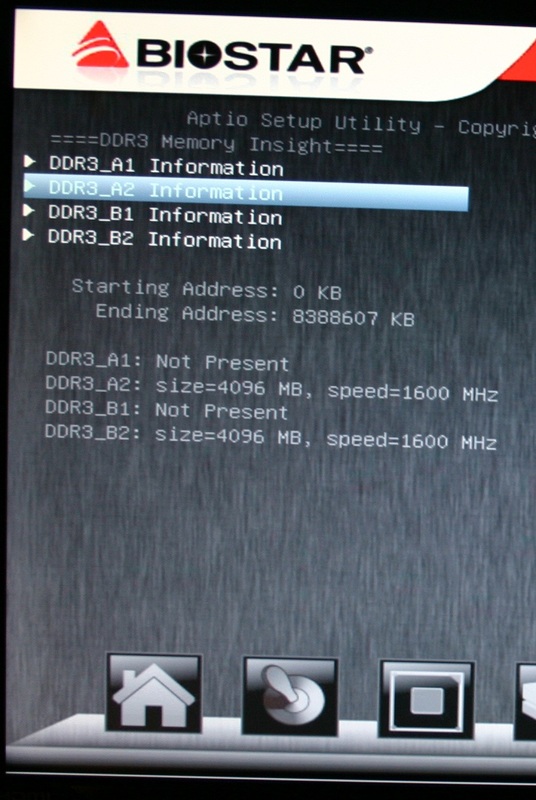 This is generally a problem with the A75 chipset, almost every single initial release versions of the BIOS out there have this problem. A quick update to the current version of the BIOS solves these problems. In general, this platform prefers tight RAM timings to much variance between the main timings and it can prevent the onboard video from working. So it is not abnormal to see auto detected RAM timings that differ from defaults for your RAM. 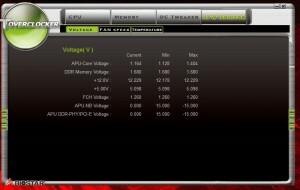 Some of the settings under DRAM Timing get repeated under the MCT Configuration area of the board. Again, these are mostly settings that will be used during more aggressive tweaking. It is great to see such options offered. 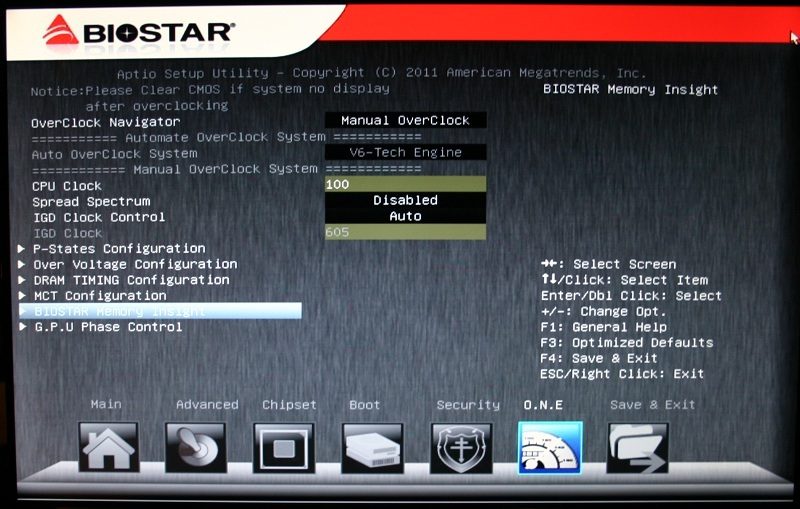 Biostar’s Memory insight is a handy tool for those of you who are not as well-versed in RAM timings, or have just plain forgotten what the memory you have in the system is capable of. It will give you a listing of the settings from the SPD chips on your DRAM on a per DIMM level. 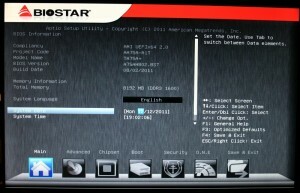 It will also give you a general overview of your installed DRAM. 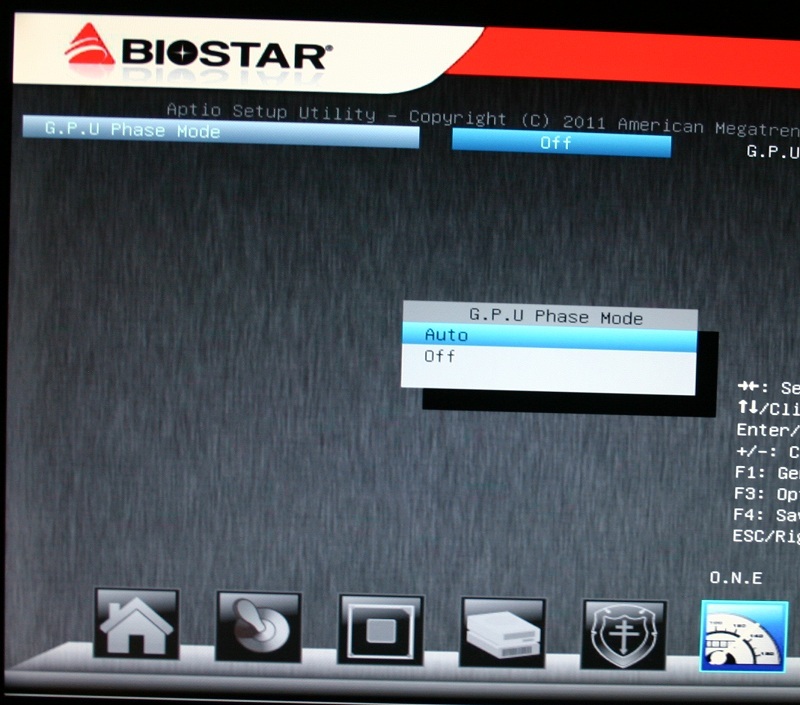 The G.P.U Phase Control section of the BIOS isn’t really much more than one setting. As was touched on earlier in the article there are a section of lights next to the CPU socket that show the power phases in use. 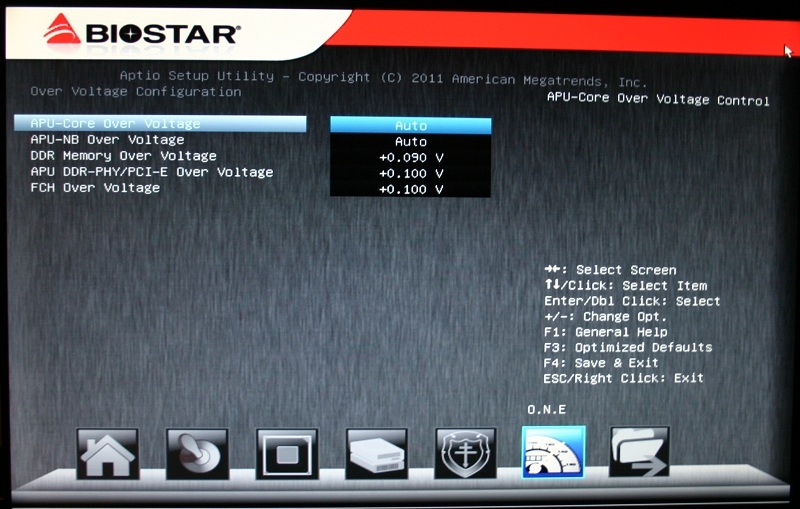 Idle or low power operation will show one or two of these lit up most of the time. When you are running the system under load you will notice that the additional phase lights will become active. Generally, if you are not pushing the system to the maximum, leaving this on auto is not a problem. However, if you are undertaking a serious overclock attempt, pushing for world records or think you might have unstable power delivery you can disable this. This will leave all the power phases in an active mode instead of shutting on or off based on system load. 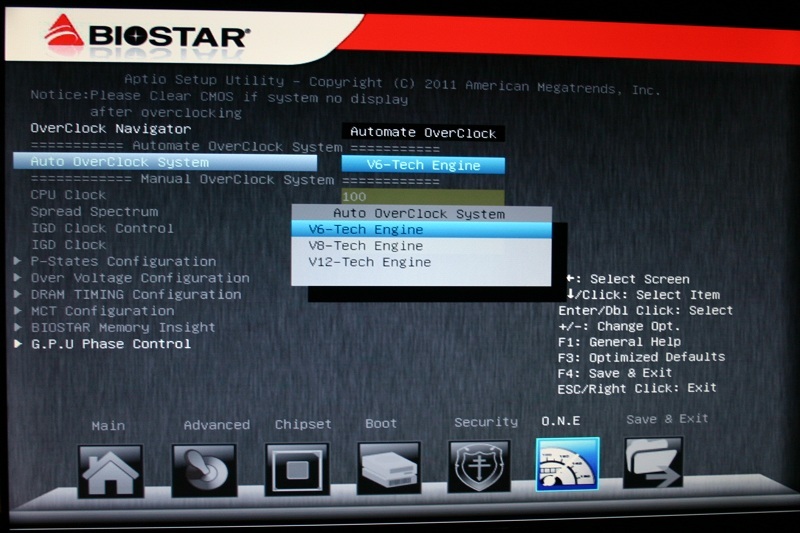 Biostar has included overclocking software named TOverclocker, which offers a decent choice of control options and a clean display of current run time information as well as system info. 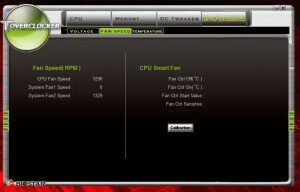 The utility allows for voltage control, overclocking, and temperature control. The interface is easy to navigate which is welcomed to both veteran and novice users. There is one problem I ran into while working with this utility though. It remembers the previous state of the software when it launches. So if you previous attempt at settings resulted in a hard crash. Your next launch of the program will either result in it attempting to run at the same speed again or the same speed minus five MHz bclk. There are times where even the five MHz drop is not enough to get the system stable. 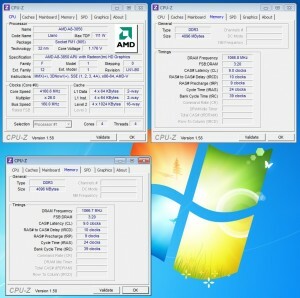 Since at times the system does not like to make a large jump in bclk speeds. The only way to get around this is to Open up the software configuration file, BSDS.cfg. Then edit the source of the problem, in most cases this will be the bclk. 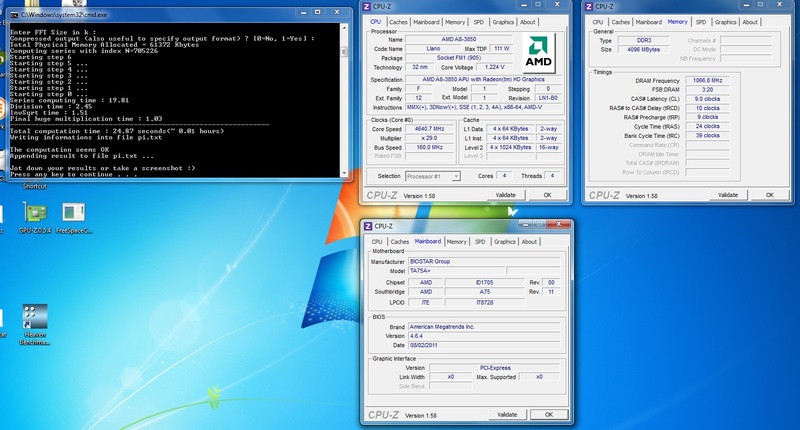 Overclocking APU’s in general started out as a very tricky process. 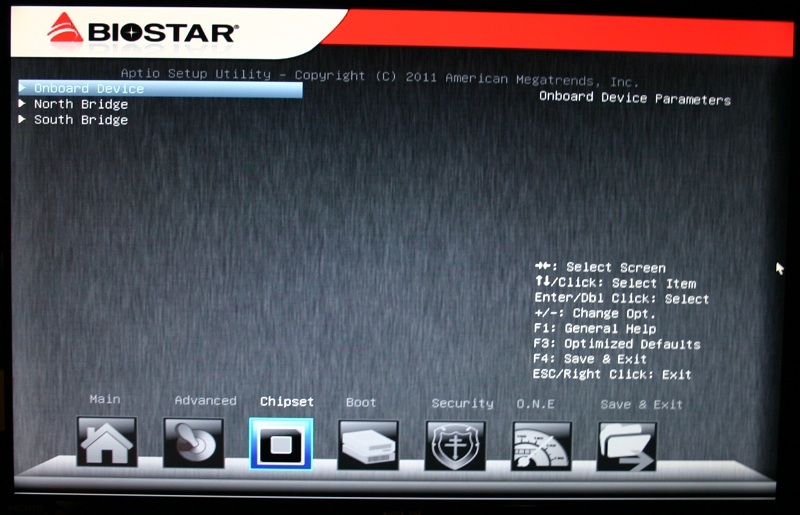 The initial BIOS release of this board had a fatal flaw that was not limited to Biostar. This made overclocking and even some general setup of the system a real challenge. As time has passed this flaw has been addressed. You no longer have to worry about serious memory incompatibilities or your ram timings changing every time you restart and potentially preventing you from booting. I want to state this again just to make it clear that this was not a problem limited to Biostar; it was a general release problem. 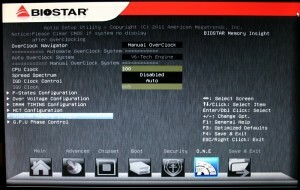 Biostar was however among the first, if not the first, to come out with a revised BIOS to solve these problems. Kudos to them for showing great support. It took several other large manufacturers almost three months to release the same fixes. 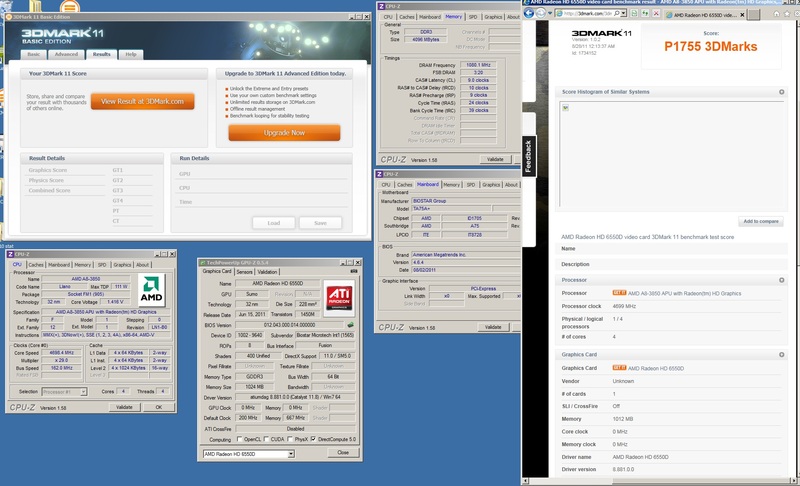 For those of you that are unfamiliar with APU’s, the video card is built into the CPU package. This creates challenges during the overclocking process. It can also provide a good deal of fun. 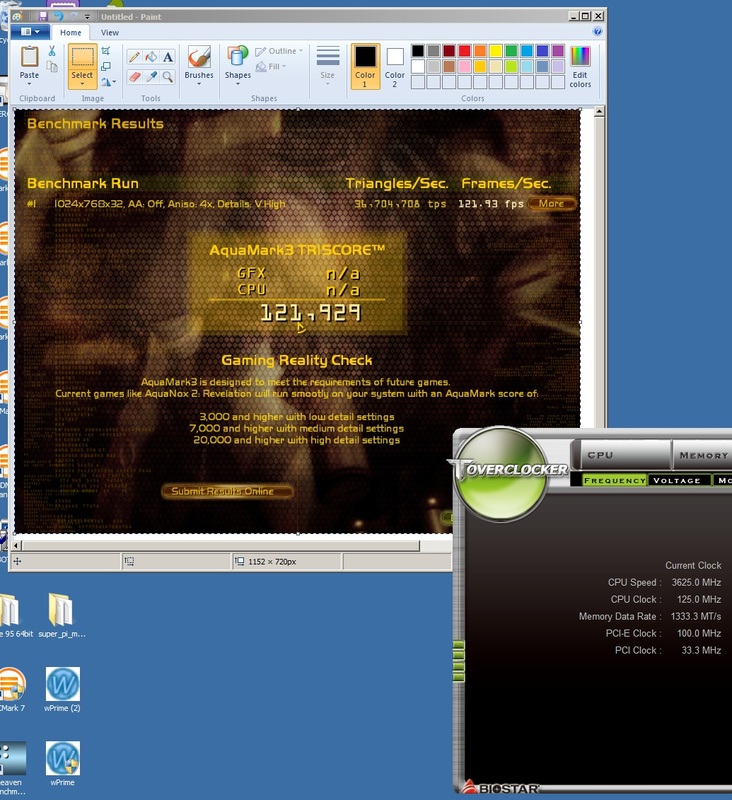 Since as you overclock the bus on the Locked versions, you are also overclocking the video card at the same time. This creates a much higher level of reliance on memory controller and system memory. Luckily, these chips have amazing integrated memory controllers. 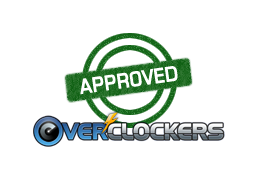 The primary means of overclocking for these locked chips is the bus clock, along with minimal multiplier control. Voltage control can be another challenge. 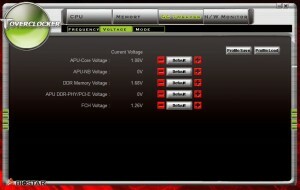 As you not only have to control your standard core voltages but the supplemental voltages for the video. I saw good overclocking performance from this board. The voltage control, while having some droop at high load, was generally spot on. One of the problems with voltage on this platform is that you really want to be frugal on power. 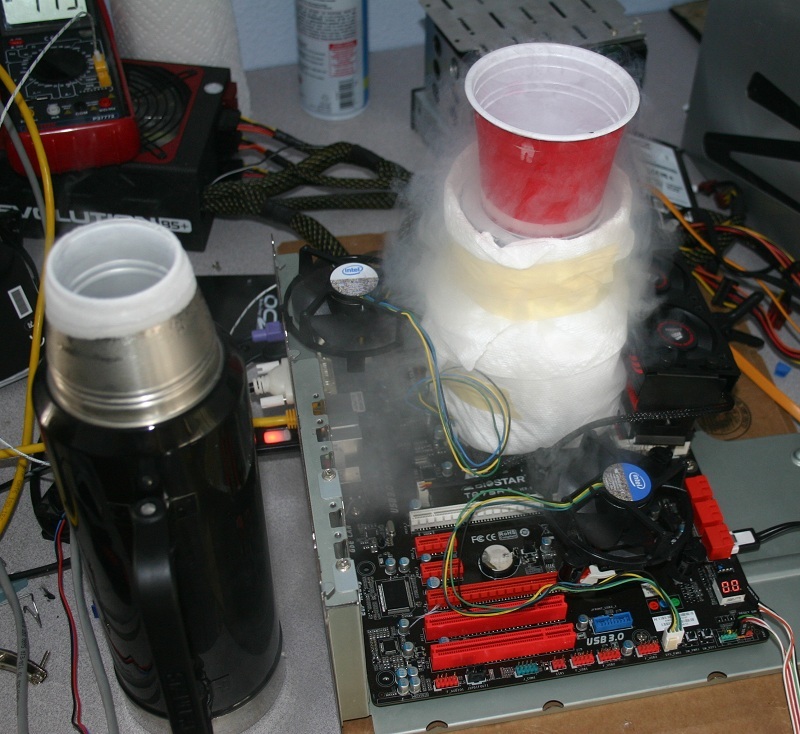 Overvolting is great when you have the cooling. However the APU’s in general have a habit of extreme temperature swings. This is not a big problem for 2D benchmarks, but can be a huge problem when mixing a four core load and a full GPU load. Most people will not have a problem with voltages on air as heat will be a problem before they reach a point that they just can’t get enough power into the chip. Sadly, this board was not quite as receptive to some of the higher speeds of RAM that I had at my disposal. I actually purchased two other sets of RAM during the process of the review specifically to help figure out what was going on (before knowing it would be fixed with a future BIOS update). 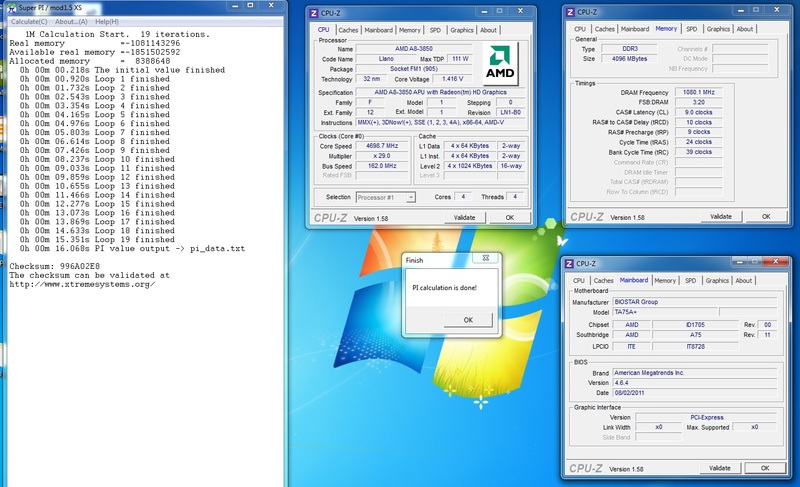 The board still however didn’t seem to want to run much past DDR3-2133 speeds. 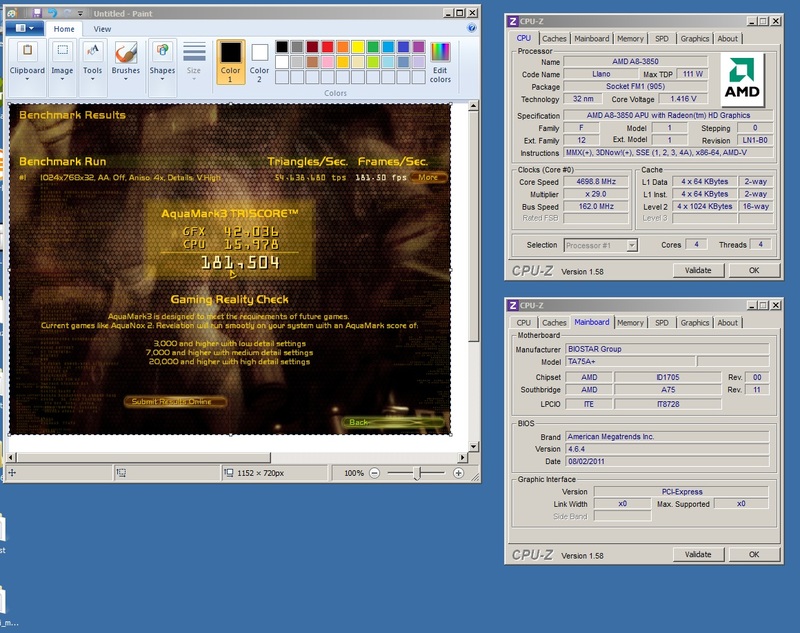 It also required some light voltage increases on the northbridge to help it boot at 1866 MHz at otherwise stock settings. Overall, I saw good performance on air that sat on par with what you would expect to see from one of these chips. 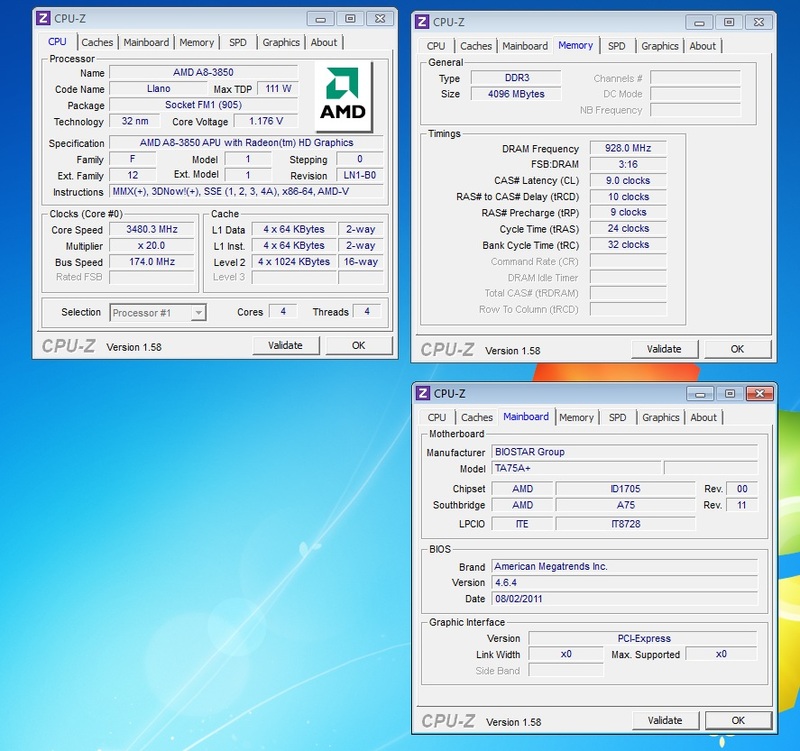 Initially, I was pushing 3.5 GHz to it. 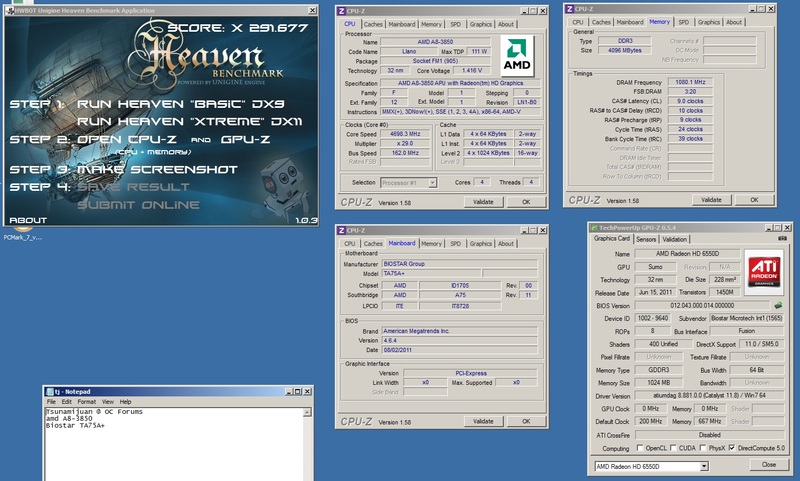 Later, after several bios revisions, I was able to pull off 3.7 GHz on air. 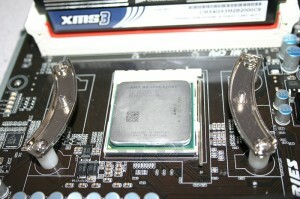 Which is a bit further than this chip had seen during a previous Overclockers.com review. I am one of those people that like to abuse hardware and take it to the max. So of course I wanted to see how this board handled the harsher side of things which in itself is a great test for what a board can handle and its overall durability. If it can handle -196 °C and being pushed to the breaking point and continue to run you know you have a good board for the rest of the week. At first, I threw this on my phase change unit, after some mild water-proofing. This enabled us to find the absolute max of the bus clock on this board, as well as figure out how close to the maximums for power consumption we could get. 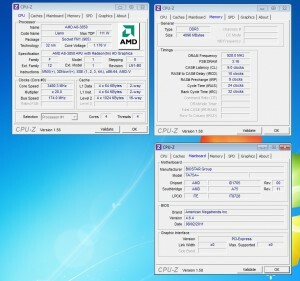 I saw great results with clocks in the 4.4 GHz range, and a max bus clock of 174 MHz. Though, from experience with this chip I knew it had more to give still. Just a little ice, good thing I waterproofed the board. I have spoken a little about power becoming a limiting factor, which was a concern of mine since the power phases on this board are somewhat small. Under liquid nitrogen this really started to become a limitation. This chip has previously run in the 4959 MHz range on liquid nitrogen, so I knew about where it should be stopping as well as the voltages required. On this board, the max that I was capable of hitting was 4785 MHz, which wasn’t stable enough to do anything besides get a quick CPU-z validation. 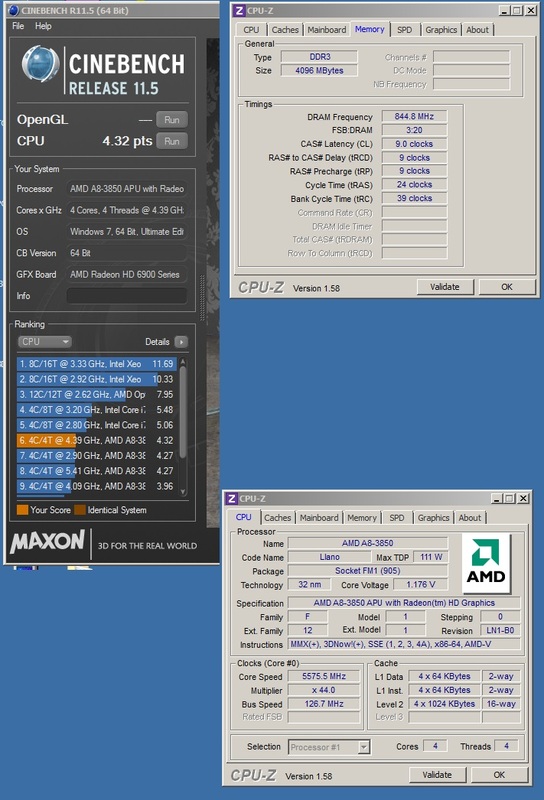 Max operational speed for 2D benchmarks was 4640 MHz. 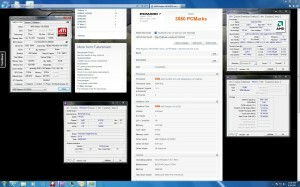 For 3D benchmarks this limitation was around the same for light stuff like Aquamark 3. 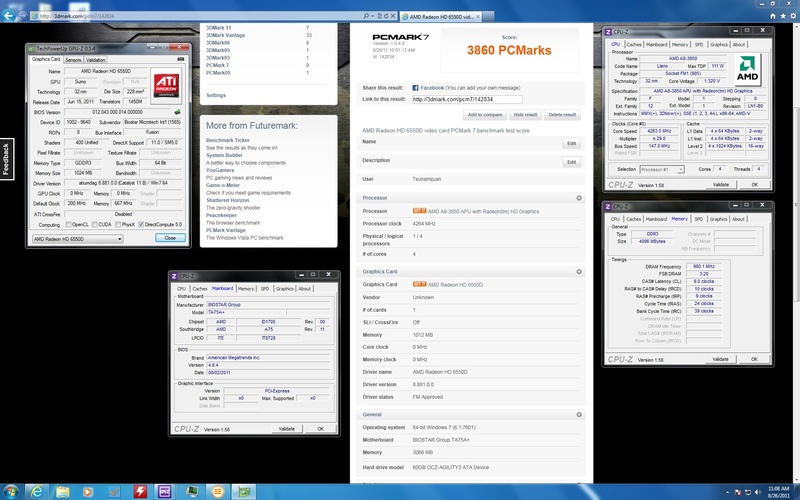 For more abusive benchmarks like 3DMark Vantage the limitation was more like 4.5 GHz. I am fairly sure that these limitations are related to power delivery. 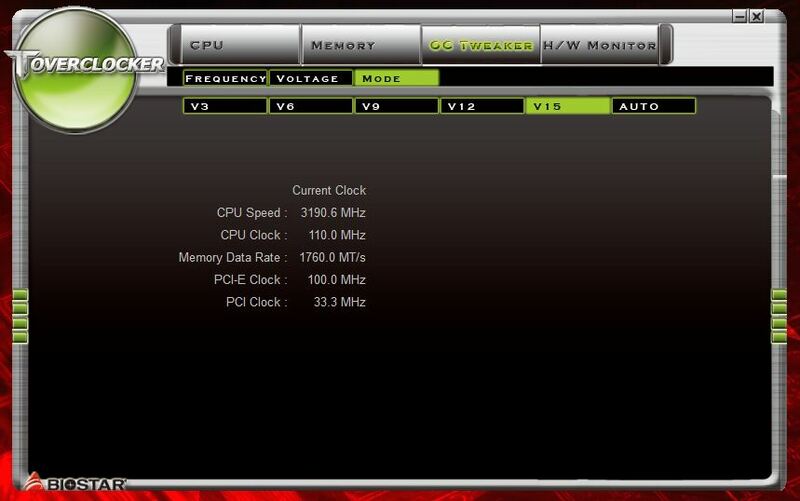 However, for the large majority of the people that will pick up this board and overclock it, they will never push it that far. 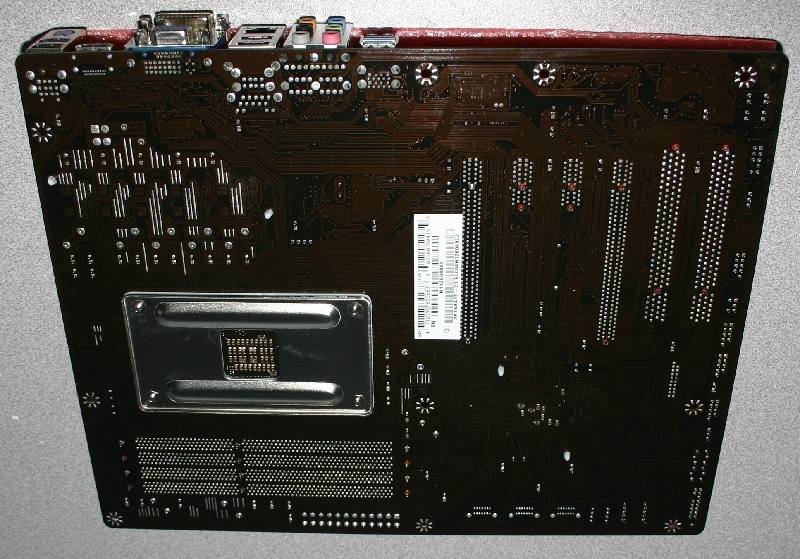 My only real complaint about this board is that if you do choose to plug a larger GPU into it, it can be a pain to remove it afterwards since the release mechanism gets obscured by the card. Along with that, the loose CPU socket, which for the bulk of users out there will not be a problem since most will only install their processor and heatsink once. Overall, this has turned out to be a great board for a great price. I have seen these boards list as low as $75, which for the level of features and performance is excellent. 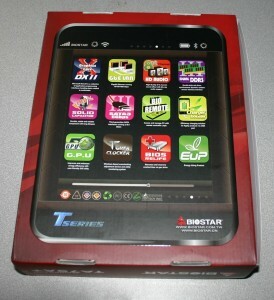 I can honestly say that I have been impressed by the build quality and support provided by Biostar on this product. While it is obviously not the best board out there for extreme overclocking, it was certainly strong enough to almost hang with some of the more expensive boards out there. How to attract thousand of enthusiasts to your review. 1) Use as main picture a picture of the reviewed product with a chunk of some kind of matter below zero degrees celsius. Nice review as always, guys. Can't wait for someone to ask me to build a PC for him and try these new AMD products once and for all.